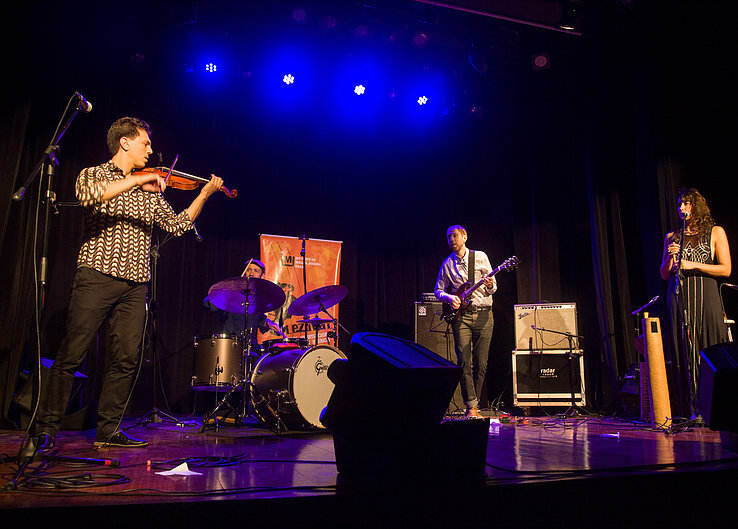 Jake Shulman-Ment // violin – – Midwood bandleader and violinist, Jake is at the international forefront of his generation performing, teaching, researching, and composing klezmer and Yiddish music. His virtuosic playing also extends to Hungarian and Romanian folk music, classical, and beyond. Richie Barshay // drums – – Dazzlingly versatile, sensitive, and creative, Richie’s rhythmic world enjoys an expansive palette. He has toured with the Klezmatics, Chick Corea, Herbie Hancock, and many other groundbreaking artists. Yoshie Fruchter // guitar – – Yoshie’s unique blend of rock, jazz, experimental and jewish styles ties together the Midwood sound, with one foot in traditional Jewish roots, and the other constantly exploring. He is one of New York’s most in-demand guitarists. Eleonore Weill // vocals, flute, hurdy gurdy – – Singer and multi-instrumentalist with a broad palette of influences, from classical and early music to Yiddish, Occitan and Romanian folk, Eleonore contributes an extraordinarily natural, genuine musicianship. She is also one of few singers versed in the unaccompanied Yiddish folk song tradition.